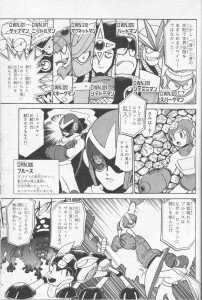 As has occurred quinquennially since time immemorial (aka roughly every 5 years since the late nineties), Hitoshi Ariga is hard at work putting out yet another repackaging of his Rockman Megamix manga series. These latest versions of Megamix 1 and 2 and Gigamix 1 and 2 are already available in Japan, while Giga 3 is set to release there later this month. My servbot sense is tingling that Udon is going to be jumping on to bringing these newest compilations stateside. Call it a hunch. Should fans who already have the English editions be excited at the idea? I think they should. Our 2010 English-edition of Megamix 1, 2, and 3 are actually Japan’s 2003 editions, which makes them two revisions behind our Japanese counterparts. Japan’s 2009 and 2015 editions of Megamix are parsed into 2 larger volumes instead of 3 smaller ones, and exchanged the short 4-koma Rockman World 5 and Soccer comics and partial Rockman Maniax filler with another Rockman comic Ariga did in the nineties, “The Men who Made Rockman – Rockman Birth Legend”. It’s the manga adaptation of Capcom’s development of the games Rockman 1 and 2, filled with lots of interesting trivia and behind the scenes anecdotes from Keiji Inafune’s actual experiences. You might recognize it as the story where the secret origin of Bondman was first told, and yet this 2 part comic has never had a proper English translation. There’s also old as well as new interviews with Capcom staff and Rockman manga artists, and even new cover and tribute art (and that goes for the new Gigamix editions as well). Ariga’s been interviewing Rockman creators since 1999 and his include some of the most in-depth fan-oriented exclusive content ever published. Moreover, there are little revisions throughout the book which you may or may not even notice. Never one to be content to rest on his laurels, Ariga always goes through and adds little touches, refinements, and corrections to previous versions. The most common thing being so far every edition has had the lettering completely redone and featured improvements on the artwork. Sometimes it’s as simple as touching up little details in scenes and backgrounds to look a little more professional. Other times he completely revamps the panels and the story to fit his overall vision, as he did prominently in the 2003 and 2009 editions of Megamix. Ariga’s Rockman stories were first compiled in 1996 in the book Rockman Remix, compiling the stories “Destruction Order” and “Metal Heart”, as well as his X series manga based on the Carddass original story, “Rockman X Mega Mission”. These stories were originally written and intended to be side stories that could take place between or after the games. However as he continued his stories into Rockman 4, 5 and 6 Hitoshi got bolder and began to do his own thing with the stories, actually overlapping or overwriting the events of the games. 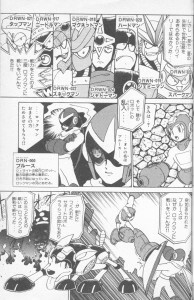 Ariga realized by the end of those chapters that he actually wanted to do his own version of the Rockman story instead of just filling in the gaps, and so in the 2002-2003 revision he created a new chapter “The Birth of Rockman” as his chance to do his own Rockman origin. He then reworked entire sections of “Destruction Order” to become “R Destruction Order”, becoming his own adaptation of Rockman 2. 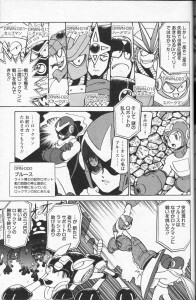 Metal Heart didn’t really work on its own as a Rockman 3 adaptation, and he had been wanting to work on a new volume to include adaptations of Rockman 3, 7 and Battle and Chase, but at that time for what Ariga himself calls “grownup reasons,” the project fell through. In 2009 he got another chance and those story ideas materiaized into Rockman Gigamix #1. 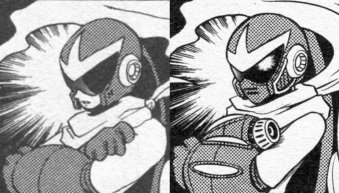 The new Rockman 3 story “Asteroid Blues” caused a few changes to his established storyline and so once again he had to go back and rework parts of Megamix to align with the new material. 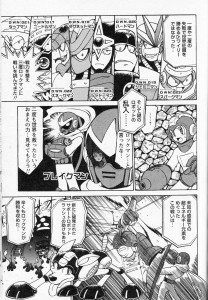 The original versions of these stories were later preserved in 2011’s Rockman Maniax, which is another great book which contains a very complete compilation of Ariga’s early works that didn’t make it into the 2003 Megamix (like the complete Dr. Rightot saga) and has some really great bonuses to boot, like Ariga’s concept drawings and the Rockman 9 mini manga he made for the R9 Arranged Soundtrack and an exclusive and revealing interview with Rockman’s other dad, Akira Kitamura. In a perfect world Udon will be bringing that book to the English speaking public as well. Take a look at the following collection of Japanese edition scans as a small example of how many changes a single page might undergo between versions. Sample page from Rockman Megamix (1997). This page was created as a summary of the events of the game Rockman 3 to serve as a basic introduction to the chapter “Grim Reaper of Resurrection”. The original page contained a typographical printing error at the bottom of the page, the text over Rush’s head that introduces him as a “newly constructed support robo”. This was corrected when the page was reused in 1998’s first edition of Rockman Megamix 2 shown below. Otherwise these two versions are exactingly similar (aside from the differing quality of these scans). Sample page from Rockman Megamix 2 (1998). In 2003’s edition of Rockman Megamix the page dimensions and image size were increased, allowing for revisions of all of the lettering to make better use of the space. The font itself was changed and the text imbued with a wider utilization of kanji with furigana, while many of the awkward line breaks that would often occur mid-word (like Wily’s name in the text bubble on the top-right) were corrected. The old non-standard 2-dot (..) and 4-dot (….) ellipses were converted to a more standard three-dot pattern (…) and uses them less frequently, while some sentences were completely rewritten for better sense of flow. Sample page from Rockman Megamix (2003). Some major examples of rewriting exist on this page between versions. At the top right of the page the robot masters were initially listed as “DRWN” standing for Dr. Right & Wily Number”, to demonstrate how both had worked cooperatively on the development of these mining robots, as indicated in the game’s story. However, “DRWN” was never an official designation from Capcom and Ariga decided to change it simply to “DWN” or “Dr. Wily Number” in the 2003 edition onward (and when “Asteroid Blues” was later finished, Dr. Right no longer had any hand in their creation according to the story). The lettering on the “DRN” was moved for Spark Man where it was initially placed above his head, it now appeared below his face and directly above his name like the other bosses. The text bubble at the top-left is reworded. The box mid-page talking about Blues’ past and his power malfunction was changed from a defect in his “power circuit” to his “power reactor”. Rush’s aforementioned bubble was again corrected and now reads “support robot” instead of “support robo”. Sample page from Rockman Megamix (2009). Fast forward again to 2009. With “Asteroid Blues” now a fully formed entity lined up for later publication, Ariga saw fit to change things yet again to make them more streamlined with the upcoming Gigamix book. The art on the page has been changed dramatically, most notably to introduce Break Man instead of Blues. Many of the images are revamped as well, the boss mugshots have little detail changes like Spark Man’s face, Hard Man’s eyes, Shadow Man’s mouth, Needle Man’s gem, and Top Man’s head. Rock’s middle panel pose, background and dialog is changed (now a double 3-dot ellipsis instead of “You are…?”). 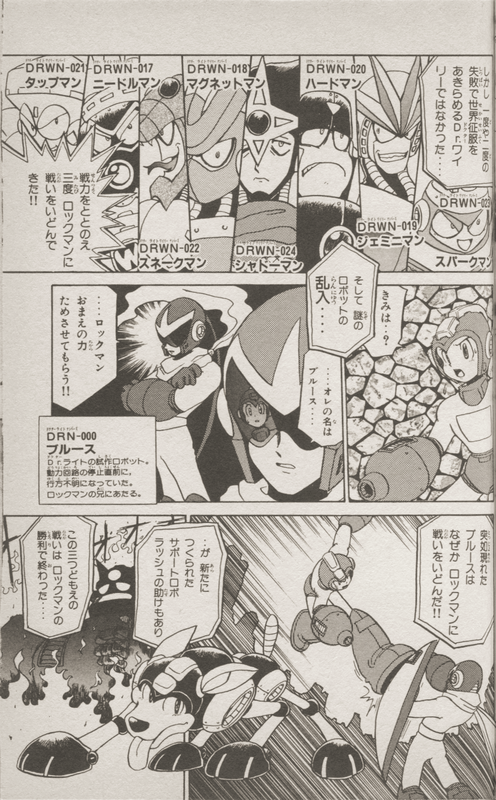 Instead of introducing himself as Blues and asking to see Rockman’s power, Break Man now muses “you must be Rockman, I heard you saved the world twice over… show me your power! !” The battle image between Rockman and Blues with a background that looks like a torn comic book page is now a battle between Rockman and Breakman with a background reminiscent of the spaceship in Gigamix. The lettering has been changed once again, removing a lot of the furigana to save on space. The text bubbles now make purposeful mention of the uncharted asteroid and the super energy elements found on them. 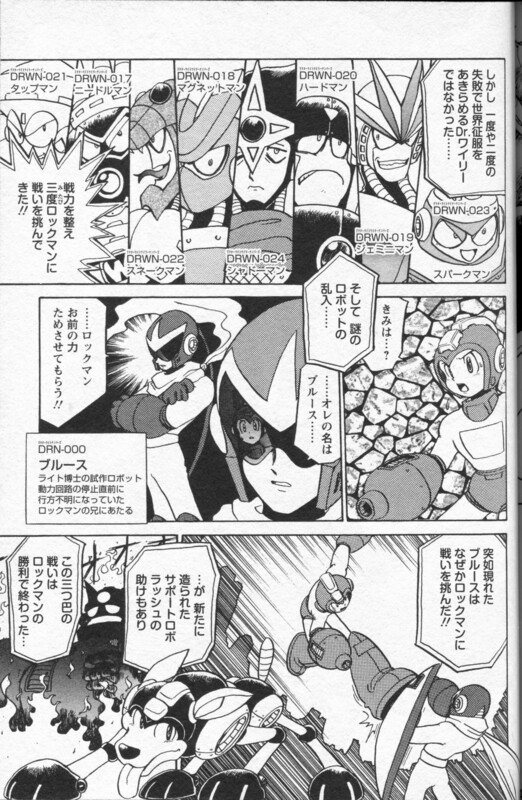 Having made such drastic changes, Ariga decided to include a version closer to the original pages in 2011’s Rockman Maniax, preserving them intact for his fans. However, they were not completely without change either. Sample page from Rockman Maniax (2011). While the artwork was mostly faithful, the lettering and text in the 2011 Maniax version was changed once again. It went back to the old version of the story with Rush being a “support robo” again and Blues’ “power circuit” is broken again rather than his “power reactor”, but other things are changed like “Dr.” Right is now referred to by the more Japanese-sounding title “Right-hakase” (meaning pretty much the same thing but closer to “professor”). The text has once again minimized the furigana, which looks more compact but also makes it a bit harder for younger readers and foreigners to decipher. Many of the ellipses have become double ellipses (……) and line breaks are re-managed once again. It goes to show that even with trying to preserve his original works for posterity, Ariga and company just can’t resist changing a few things. At this point it’s as much a tradition as endless re-releases of the NES Rockman titles. Now Udon hasn’t announced it yet, but if the newest Megamix adaptation arrives stateside we will have a slew of new little things to notice compared to the previous English edition, and enough new content we haven’t had before to make the purchase worthwhile for people who missed out the first time and for old fans who wish to show support for Mega Man in this rocky time. Now, let’s see if I’m on the money. 2 Comments to "Infinite Remix"
Oh my lord… So many remixes. I was SURE I had read a scanlation of the 2010 version, but now I’m confused. Thats a BREAK recton… I mean, the only thing that I realize between the versions, was the Roll’s face. And why quit the DRWN? Also, how explain Reague and Tango in “Metal Heart”, and Beat in “The Return of Shinigami”, I mean that story happen before or after Mega Man 5? « Not just another day.